This post is sponsored by the Outlet Shoppes of the Bluegrass. As always, all opinions are my own. This post also contains affiliate links. 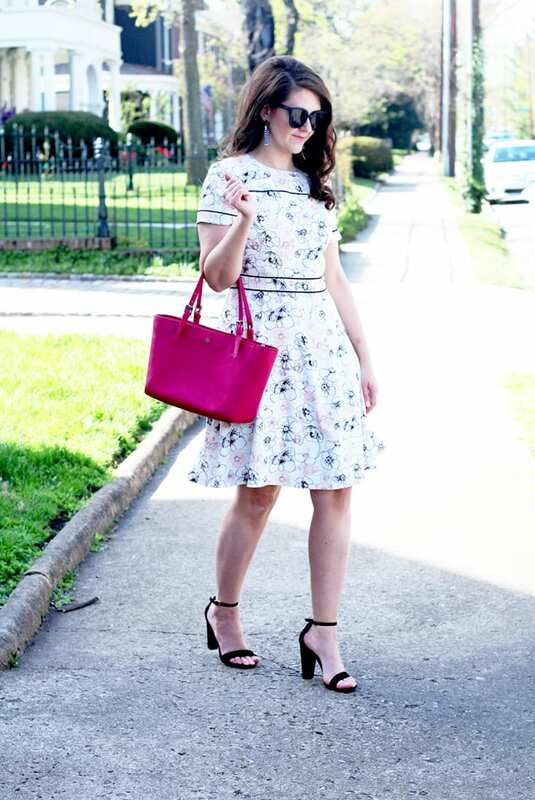 There’s always an event going on in the spring–Easter Sunday, Keeneland, the Kentucky Derby, and Mother’s Day, just to name a few. 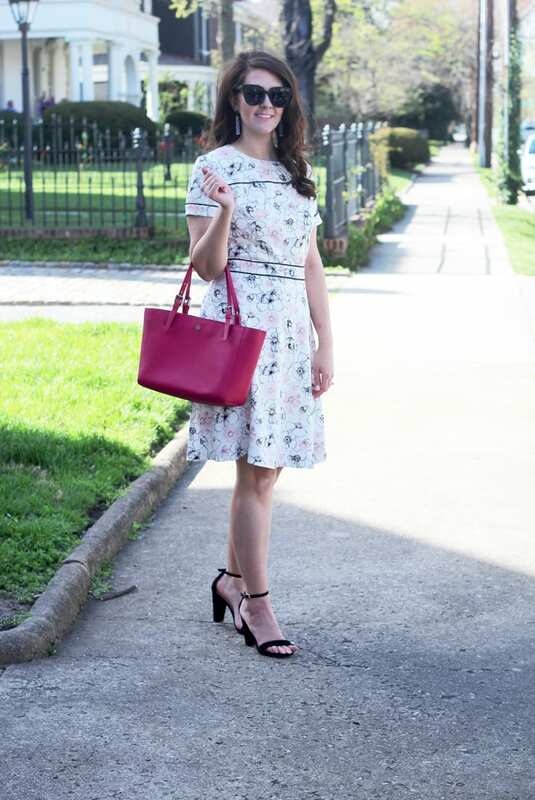 While I was outlet shopping at the Outlet Shoppes of the Bluegrass with Nicole from What Nicole Wore this weekend, I found the quintessential spring dress that will work for any or all of these events! Be sure to checkout the end of the post for two BIG announcements for our local followers! 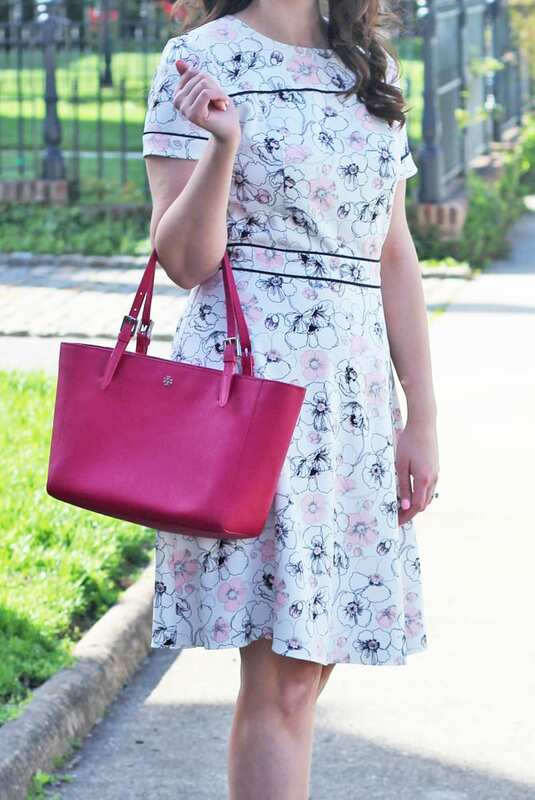 Dress: c/o Brooks Brothers Outlet at Outlet Shoppes of the Bluegrass (similar, similar, option) Tote: Tory Burch (also here) // Earrings: Sugarfix via Target–just $12.99! // Shoes: Express (identical–great deal) // Sunglasses: Quay–only $50! 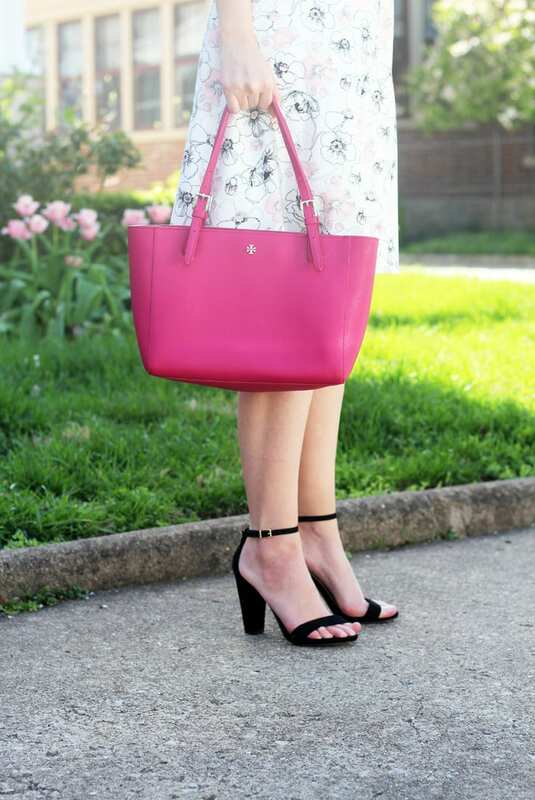 Blush is probably the it color of spring. I love this black, white, and blush color palette. 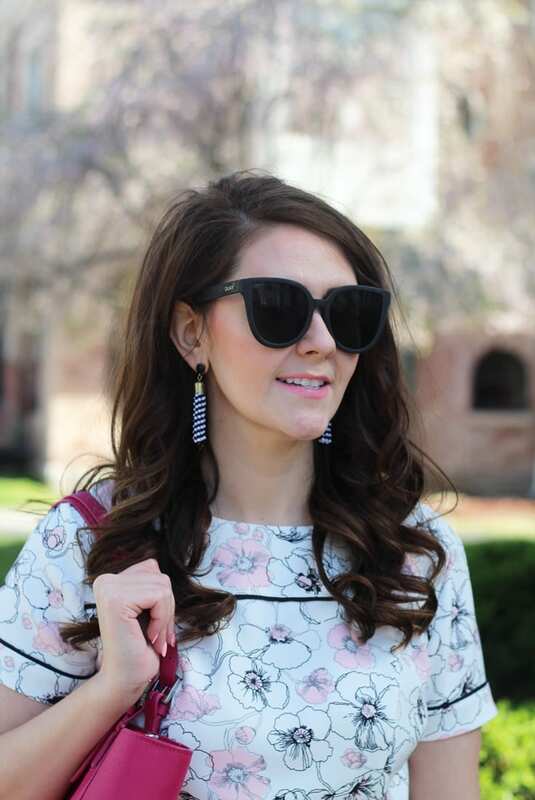 I added my Sugarfix tassel earrings in black and white to play off that color scheme. And while I rarely black shoes in the spring, these black strappy heels were perfect to pick up the piping on the dress. I total forgot a bracelet or watch, and realized it as we were getting ready to shoot. Chauncey said to tell y’all that I’m going for the minimalist look.haha Overall, though, by keeping my jewelry simple, this is a very easy, polished look. And you can always throw on a hat or fascinator if you’re off to the races! 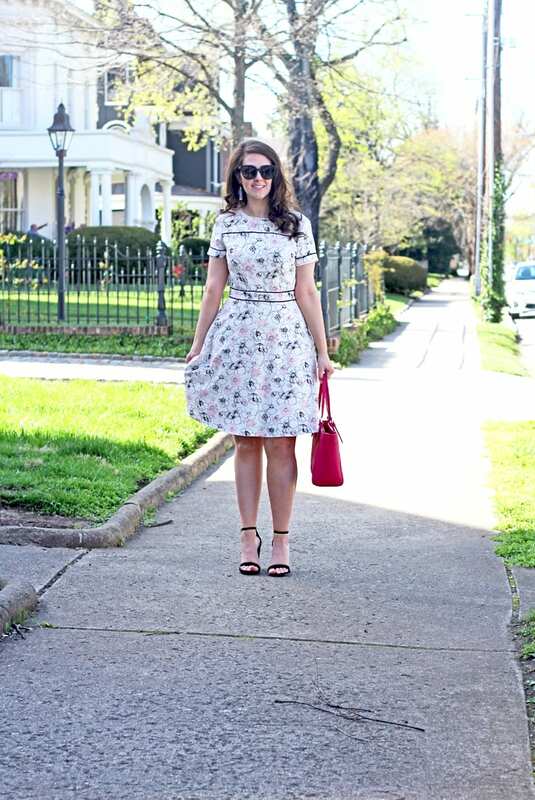 I had so much fun shopping with Nicole at the Outlet Shoppes of the Bluegrass in Simpsonville–be sure to check out her look she created from the outlets as well! I love the mixture of shops there and how many places there are available to shop! Here’s a little behind the scenes look at our girls’ day at the outlet:) The $250 giftcard giveaway to the Outlet Shoppes of the Bluegrass will go live TONIGHT at 8:30 p.m. on our Instagrams, so be sure to follow along. And we’re hosting an event at the Outlet Shoppes of the Bluegrass THIS SATURDAY–details below the video! The Outlet Shoppes of the Bluegrasss are right outside of Louisville, and super easy to get to from Lexington when you hit interstate. When I’m looking for great deals on my favorite brands, like J. Crew, Kate Spade, and Gap, I hit up the outlets. 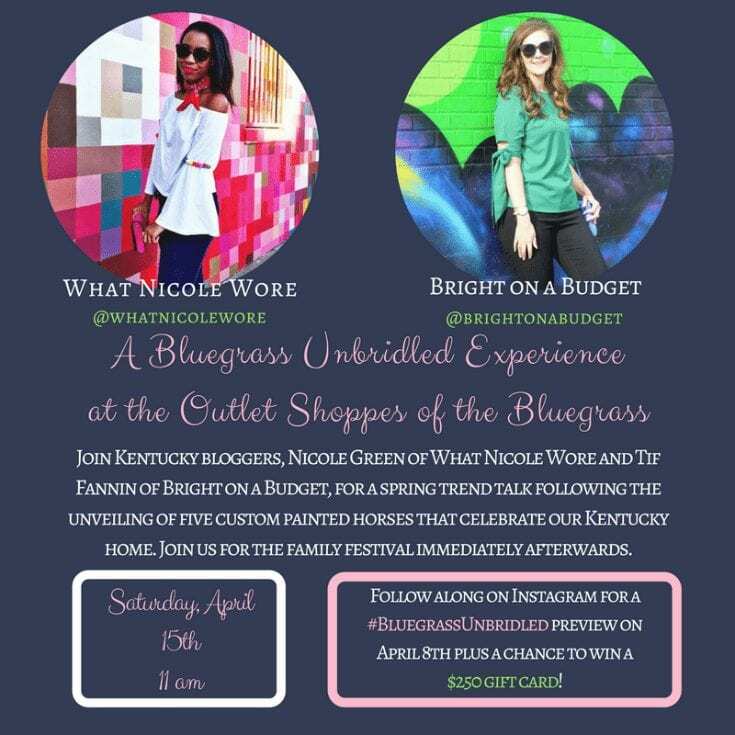 So I’m super excited that Nicole from What Nicole Wore and I will be hosting an event at the Outlet Shoppes of the Bluegrass THIS SATURDAY, April 15. Get all the details below or click here! You can also checkout the Facebook event page here.